Urban Quiltworks: Shreddies and the NEW diamond Shreddies. Shreddies and the NEW diamond Shreddies. I loved Shreddies as a kid. Remember the 100% whole wheat squares cereal that would eventually mush up if you left them too long in the milk? I still remember waking up extra early on Saturday mornings to watch the Jetsons, poured myself a huge bowl of Shreddies and piled a layer of sugar on top. Loved loved loved them. Now, Shreddies has a new marketing campaign which I think is the cutest and cleverest thing...they have now come out with "diamond" shaped Shreddies. They haven't changed at all. They're just doing a silly spin. 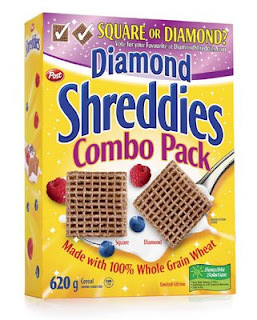 As I was walking around Zellers today, I had a good giggle about the newest gimmick - The new and improved Diamond Shreddies COMBO pack! You get 1/3 of the regular shreddies combined with the diamond shreddies in the box!! 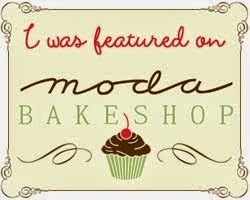 OMG I just loved the cleverness of this marketing! !